Find something to do with the kids in April! Share your experiences with us by tagging us on Instagram or using #busycitykids to be featured! Enjoy yourselves! Lights by Dreamworks - Sat 25th March to Sun 30th April. Lights by Dreamworks – The Experience is coming to the Mornington Peninsula this March and April for an Australian-first event under the Big Top and will see Shrek, Kung-Fu Panda and more than 100 of DreamWorks’ characters brought to life in a large-scale lantern experience. All ages. Ticketed. Kids under 2 free. More info here. Melbourne Food and Wine Festival (MFWF) - Fri 31st of March to Sun 9th of April. Enjoy great food events with family and friends at the MFWF. Our top 8 events on the blog, more info here. ‘Wonders of the World’ LEGO® exhibition at Melbourne Museum! - Sat 1st April - Sun 7th May. Ever dreamed of visiting the Empire State Building, Arc De Triomphe, Big Ben and other world-famous landmarks. Thanks to Ryan ‘The Brickman” McNaught, Melburnians can explore a world of epic LEGO® masterpieces and learn about some of mankind’s most amazing achievements from all over the globe, in a fully interactive, educational experience. All ages. Ticketed. Our review here. Melbourne Museum - Sat 1st to Mon 17th April. Kids are invited to explore animal diversity in a range of hands on, creative activities and tours to learn about animal habitats, diversity, evolution and more these Fabulous Fauna Autumn School Holidays. Daily Song Bird Tours will educate kids about the remarkable evolution of song birds. Youngsters will get to build their own animal, choose a habitat and photograph it in its natural setting. Songbird Tours and Wild World of Animals. All ages. Included and free with general entry. More info here. Scienceworks - Sat 1st to Mon 17th April. Neon Nature: Divide and Multiply. An incredible neon canopy that evolves every day inspired by nature’s rules and patterns – and grown by you! Using neon straws and a simple joining technique, come and experiment with branching or forking shapes found in plants, trees and everywhere in nature. All ages. Ages 5+ recommended. Included and free with general entry. More info here. Healesville Sanctuary - Sat 1st to Mon 17th April. A Koala Close-Up Encounter will take place daily in the new Koala Forest exhibit. The treetops boardwalk is an impressive new home that sees koalas living the high life and now visitors can enjoy premium experience in the stunning surrounds too. All ages. Included with general entry. More info here. Melbourne Zoo - Sat 1st to Mon 17th April. Visitors will be amazed by the seals impressive new skills. They will be showing off their behaviours in a brand new daily Keeper Talk where visitors will learn about the new community campaign When Balloons Fly, Seabirds Die. All ages. Included with general entry. More info here. Werribee Open Range Zoo - Sat 1st to Mon 17th April. Hang out with the hippos! Each day at 1.10pm Zoo Keepers will provide a fascinating insight into the behaviours, care and unique personalities of the hippo group in a brand new Hippo Keeper Talk. All ages. Included with general entry. LEGOLAND® Discovery Centre - Opens Tues 18th April. LEGOLAND® Discovery Centre is coming to Chadstone Melbourne this April! Little and big kids will love this centre which has much more than just plain LEGO! Experiences at the centre include a look at MINILAND Melbourne, a LEGO Factory Tour, two rides to give LEGO fans the ultimate thrill, a LEGO Brick Play area, a 4D cinema and a behind the scenes view of the Master Model Builder hard at work! All ages. Ticketed. More info here. Easter Fun Day at Rippon Lea House & Gardens - Sunday 16th April 2017. Get the family together and enjoy a wonderful day out at Rippon Lea House and Gardens. Take part in our Easter egg hunt in our magnificent grounds, meet the Easter Bunny and our very own Ripplea Bear! There will be African drumming workshops, petting farm, market stalls, food trucks, craft, boat ride, face painting, outdoor games, and the Mansion will be opened for all to explore. Ticketed. More info here. Good Friday Cadbury Easter Egg Hunt and Family Picnic - Friday 14th April. As we hop closer to Easter, Cadbury is preparing to bring joy to thousands of families with its annual renowned Cadbury Easter Egg Hunt and Family Picnic, taking place on Friday 14th April. 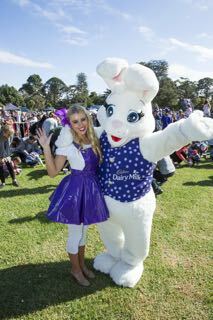 Held at Werribee Park, the Cadbury Easter Bunny will hide a surprising 400,000 Cadbury Easter Eggs for rummaging hands to find, making it the largest Easter egg hunt of its kind in Australia. Proceeds from the day will go towards The Royal Children’s Hospital’s Good Friday Appeal and Victorians are encouraged to get in quick to secure their tickets to the event; which is an annual sell-out! Ages 3 to 12 yrs old. Ticketed. More info here.